The Fancy Pants Leggings are close fitting leggings with a separate bum panel. The panel gives extra room in the rear for little ones in nappies and a chance to use contrast fabrics and treasured scraps or to feature your own designs. 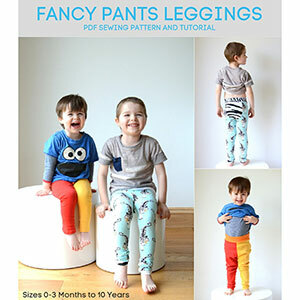 Suitable for both boys and girls, the leggings can be used for daywear, an extra layer in winter or pajamas. The pattern includes two different ankle finishes, two different waistband styles, width adjustment and a shorts option. Perfect for beginners and those new to sewing with knits. Pattern is available in sizes 0 months through 10 years. Recommended fabrics are jersey, interlock, thermal or ribbed knit. For best fit choose a fabric with 4 way stretch and at least 50% stretch. For the waistband and cuffs use ribbing or jersey with at least 50% stretch. 1/4 ribbing or jersey needed for waistband and cuffs.